Ahhh...the end of an epic. So I just finished reading the final installment of this fantastic story, and I can't help but feel saddened. 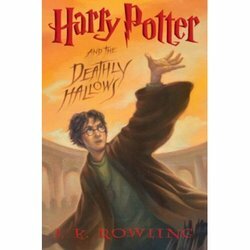 I realized that after each of the previous six books I always could say, "that was great, can't wait for the next one!" Now, that is no longer true. I will miss Hogwarts, The Burrow, Hogsmeade, and Diagon Alley. I will miss Harry, Ron, Hermione, Dumbledore, and even Snape. I will miss the spells, enchantments, and magic of this incredible world invented by J.K. Rowling. Of course, I can always read them again (and I surely will). But there is still the lingering disappointment that the story is finished on paper. I wonder how Harry will stand the test of time? In 30, 40, or 50 years, will these books be viewed as the amazing literary achievement I think they are? I've just discovered a book that I need to read. I've often heard (and *gulp* repeated without confirmation) that Christianity is the fastest growing religion in the world today, only it is growing in South America, Africa and Asia. Turns out that it's true, and Philip Jenkins has some interesting stuff to say about it. The new Christianity will be liturgically anarchistic compared with the staid services of white, upper-middle-class people today. It will be overwhelmingly the faith of poor nonwhites living south of Europe, the U.S., and present-day Russia, and it won't reflect the values of the wealthy global north. It will revive Christianity's root emphases on healing and prophecy because its adherents will resemble the poor and oppressed who first embraced the redemption, the healing, and the blessing that Jesus promised. I've been fascinated by this idea for some time. This trend of growth in poorer nations among non-white populations seems incongruent with the current global identity of Christianity as a wealthy white man's religion. But Jesus wasn't wealthy or white, and he never went to Europe. He hung out in what we call the Middle East, helping and healing a bunch of poor and sick people. In the 300 years after his death, Christianity virtually exploded among poor minorities until the Roman Emporer Constantine converted, at which point I guess Jesus became a white man. It seems to me that if we are going to follow the Spirit and get on board with His movement, we need to turn our attention to the poor and needy. It also seems that we should focus a lot more on what is going on outside of our borders, and find ways we can be part of what God is doing. Here's a link to an article on the Foreign Policy Research Institute's website, written by Jenkins, that addresses the secular foriegn policy issues related to fast-growing populations of Christians and Muslims side-by-side in poor and developing nations. Here's an article that covers the topic and mentions Jenkins. I have often jokingly compared my conducting baton to Harry Potter's wand. You don't choose a baton...it chooses you. My wand of choice? It's a 14" Mollard composed of a smooth tapered white birch shaft and a precisely balanced walnut handle with fine grained rosy brown texture. Today I picked it up for the first time since early December, and I was reminded of what Harry Potter must feel like every time he leaves the Dursley's and heads to Hogwarts. My first assignment: Mozart's "Coronation" Mass in C Major, K.317. Wand in hand, I'm ready to cast some spells! I just finished Joseph Myers' book, The Search To Belong: Rethinking Intimacy, Community, and Small Groups. I always get the same feeling when I read a book that shifts my paradigm significantly. Years ago it was Generating Hope by Jimmy Long -- The first book I read that tied the "gen X" phenomenon to "postmodernism" and gave it practical legs for ministry.I have a hunch that Myers' ideas will stick with me for a while to come. As a "failed" church planter, I have a significant interest in community. With The Village, we knew that our generation wanted "community" but we just didn't know how that would work. I drew from what I knew of myself and my friends, and merged it with a few theories I had come across, and came up with something significantly ineffective. Now I know why. Myers suggests that there are four "spaces" in which we, as people, operate. Public space, social space, personal space, and intimate space. Public is where you belong, but don't have any relationship other than the connection. For example, as an LSU fan sitting in the Superdome in New Orleans watching the Tigers win the Sugar Bowl, I "belong" to the person next to me. I am part of that community in a public way. Social space is casual relationships, conversations at parties, acquaintances. Personal space is close and trusted friendships where you are more vulnerable. Intimate space is where you are "naked and not ashamed" with another. As a young married adult, I had a Sunday School class that really "worked." Looking back, I see how it touched all four spaces. The church was large, so we all belonged in a public space. The class itself (despite the best of intentions for Bible study) was essentially social space, where we gathered and mingled and had interactions. Within that class, there were smaller, self-formed groupings of personal space. My wife and I had two or three other couples that we considered trusted friends. And, of course, since it was a married couple class, we had intimate space there as well. Myers suggests that each person should have 8 public connections, 4 social connections, and 2 personal connections for every 1 intimate connection in their life. Public and social connections are not LESS important than intimate ones. In fact, they might be MORE important simply because we need so many of them in our lives. Second, in order to feel connected, each person needs to recognize in which space they belong and use that space appropriately. For example, have you ever been uncomfortable because someone started a personal conversation with you in a public space? Or, have you gone to a church small group hoping for social space, only to be forced into personal or even intimate space? The bottom line is that all of us want to be "connected" and find "community," but we may be looking for the wrong thing. We don't neccessarily need more intimate connections, and churches definitely don't need more small groups. We need to balance our connections in a way that works, and create harmony between our public, social, personal, and intimate space. This boook was a fabulous collection of ideas. If you're looking for a practical, step-by-step approach to implementation, you won't get it. But there's a lot of great stuff to get you started thinking in the right direction.